Forklift Training in Auckland and Getting a Licence - Be Certified Today! In order for you drive to forklift for a living, you need forklift training in Auckland. You need to undergo forklift operator and F endorsement trainings. The operator training will entitle you to hold certificate that makes you eligible to operate one. In addition to this, you need F endorsement to drive the equipment in public or on the road. If you have in possession full driver’s licence in Auckland, then you can take both of these trainings. However, if you only have learner’s licence or licence with restriction, you can only qualify to take the forklift operating training. Find an approved/registered forklift training instructor or school near you. Below is the directory of training providers in Auckland where you can take training from. Take the practical driving of the equipment. Instructor will supervise you on this. 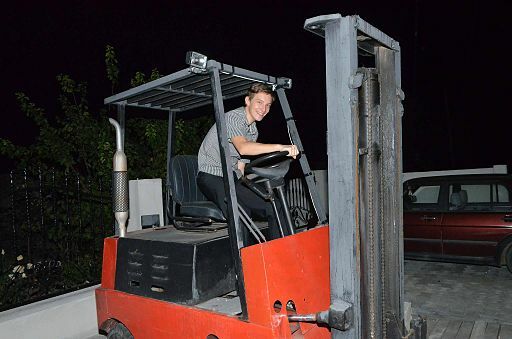 He will give you instructions to operate the forklift in safe manner. Take you time to practice. Take the theory lectures. The classroom lecture is mandatory. At this stage, you learn the basics of operating forklifts like, stacking, destacking, safe refueling/recharging, pre-inspection, safe handling and operation, parking, safety checks, maintenance, and post-job inspection. Pass the test. The instructor will administer exam. The questions are easy to answer if you learned from the practical driving and class lectures. The test will determine if your fate. Receive your operator licence and certificate. When you’re successful taking the exam, the instructor will hand over your personal wallet size forklift licence together with the certificate. You need to have an F endorsement to operate the truck on the road and in public place. Training providers can be found in many areas in Auckland. If you are a company planning to give training for the workers, you can arrange a schedule with one of these schools/trainers. Onsite teaching is the best method to supply the training. It is the better way because the operators can identify hazards specific to the workplace that should be mitigated, in addition to this, the trainer can modify the subjects to match with the environment and workers’ attitude. If you are an individual and you’ve never driven fork truck before, then expect that training course to be longer. It may take up two days. If you have some experience, then it could only takes less than a day. Before you get permitted to drive forklift on the road, you must have F endorsement on your driver’s licence. There are two classes you can be qualified for having an F endorsement, namely: Class 1 and Class 2. These classes differ in the load/weight capacity you can operate/transport on the road. The Class 1 licence is for operator with an F endorsement operating forklift with gross laden weight not more than 18,000 kilograms, while the Class 2 is above 18,000 kilograms. You must have a valid driver’s licence before you can apply for an F endorsement. The F endorsement expires when you driver’s licence expires. You can finish forklift operating training and the application of F endorsement in a day. Your role as forklift operator is keep track of the incoming and outgoing stocks or inventory. Loading and unloading of the materials and goods. Your daily duties may differ. During full swing of business operation, you may render work for long hours. If you are at least 16 years old and with good physical vigor and a holder of car driver’s licence, then you can be hired as forklift operator. Taking of forklift training will be mandatory. Your forklift operator certificate will be your key. Likewise, to be considered for the job, you will need to have good communication skills and good understanding of the health and safety in place. If English is not your native language, then, you need to present IELTS test result (this requirement may vary from company to company, some don’t require it though). If you have previous experience, then, the company can offer you better than those without. Some companies do drug and alcohol testings prior to hiring a job applicant or background check. Forklift training results in safe and healthy workplace, less equipment damage, less product loss, fewer equipment to repair, boost in workers’ morale, increase in operators’ work productivity, these are the advantages of having forklift training in Auckland. Get a forklift licence first before delving into finding an employment. It will increase your chance of getting employed very easily and offered with better salary. You can block access to cookies in your browser's setting. If you’ve granted your consent and you want to revoke your consent, you can withdraw the cookie or renew the cookie. Is New Zealand Forklift Certification Can Be Used In Australia?